The Business Flight Specialist offers cheap business flights to Bangkok for as little as £1,275. Whether you’re a frequent flyer or just taking a break to Bangkok, our exclusive deals combined with a personal and tailored approach to travel ensures our customers keep coming back to book with The Business Flight Specialist. Book with The Business Flight Specialist and be confident you're getting the best deal in cheap business flights to Bangkok on the web. Getting flights to Bangkok cheaply has never been so easy. When you're sending your delegates abroad to Bangkok you want cheap business flights and good, reliable service. We get good deals, often from as little as £1,275, because of our links with the airline industry, sourcing many cheap business flights to Bangkok around the World, and we pass our benefits on to the customer. 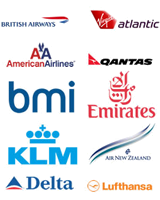 Please note that when doing research for your flight to Bangkok we check the whole of the market not just a few selected airlines.